Russell Fuel Line Kit - Lightning Motorsports - Selling Speed since 1996 ! Engineered to replace stock fuel lines exactly, Russell Fuel Line Kits are complete and ready-to-run. Built with Russell stainless steel braided hose and anodized aluminum hose ends, they easily connect the OE to the components for maximum reliability and a professional-looking installation. The stainless steel outer braid resists abrasion and corrosion and a CPE synthetic rubber liner is compatible with all hydrocarbon and alcohol-based fuels. The Fuel Line & Filter Kit, designed for Edelbrock Performer Series carbs, includes a chromed hard steel line and Russell fuel filter. 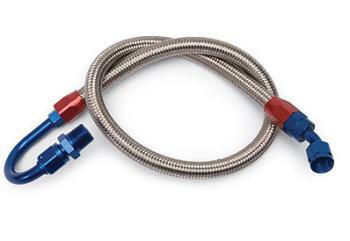 The chromed steel fuel line is available with a 3/8” barbed end and no fuel filter for universal applications. Designed for Edelbrock Square-Bore Carbs, our Pre-Fitted Stainless hoses connect the fuel filter to an Edelbrock street fuel pump or any pump with 3/8” NPT outlet include high quality Russell hose, fittings and fuel filters. Designed to replace your original fuel line these fuel pump to carb kits fit most GM applications. Kits include Big Bore Carb Bowl Fitting, Fuel Pump Adapter, two Full Flow Hose Ends and a pre-cut length of -6 AN ProFlex Hose. These kits are offered in the traditional red/blue anodized finish only. Designed to use with Russell’s -8 AN Dual Inlet Kits, the Fuel Pump to Carb Kit is constructed of ProFlex Stainless Steel Braided Hose. Extra adapters and 4 ft. of -8 hose are included to work with most aftermarket high volume engine mounted pumps. Russell’s Tunnel Ram Kit is designed for “high rise” or tunnel ram manifolds with dual carburetors. This kit offers a 3/8” NPT female Y-Block inlet/outlet including two big bore carb bowl fittings, four Full Flow Hose Ends and two 18” lengths of -6 AN ProFlex Hose.